Dismantling of part of the klinger warehouse shelter (dimensions 31mx60m), construction and installation of new steel structure and erection of panels. Dismantling of part of the klinger warehouse shelter including steel structures, anchor bolts and panels _ 64.000 kgs + 4.600m2 panels. Dismantling of chain transportation Klinker system. Dismantling of supporting steel structure. Installation of anchoring bolts on warehouse columns (Opposite distance 54m). Mounting of root supporting structure. Erection of root supporting structure with the use of 160tn, 90tn and 50tns cranes. Ancoring botls tightening. Erection of roof supporting beams (Total weight 200tns). Connection of new trapezoidal covering plates (4200m2) and special plate pieces. Detailed engineering, fabrication, installation and start-up of a new Rotary Kiln and a new Raw Material Preheat Train for a mineral wool production plant in Terpni, Serres in Macedonia Greece. Thermal and mechanical design of a preheat system of the raw material before it’s introduction into the kiln using the exhaust gases from the kiln, which included the following: Air-to-air heat exchanger, material pre-heater, cyclones, filters, stack. Design of the complete material transportation system, including conveyor belts, screw conveyors, ducts, chutes and elevators. All necessary steel structures and access platforms and stairs. Commissioning and start-up of the Kiln. 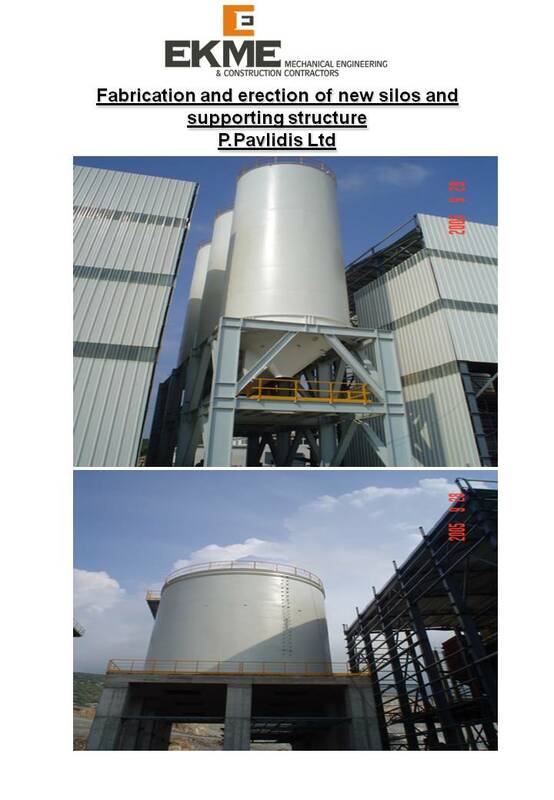 Design, material procurement, prefabrication and erection of four metallic silos (2 Φ5400 & 2 Φ9800), steel structure of the silos Φ9800 and ladders and platforms. Installation of primary crushers, separators and secondary crushers including supports (170 tons). Fabrication and installation of hoppers, conveyors and supports (555 tons). Dismantling of old duct, material procurement, fabrication of the new duct and compensators (metallic part), modification of the existing platforms, installation of the new duct, installation of compensators and supports, insulation of new cuts. Fabrication of 160 tons of steel structures for the 6th floor of the preheater’s building in TITAN CEMENT factory. Material procurement, fabrication, painting and field installation of 35tons steel platforms on the Pre-Heater Building. Installation of prefabricated structures for new homogenization silo including, supply bleed stir-up system (47,9tns), air ducts (5tns), steel accessories (2,96tns), mechanical equipment (18tns), platforms (30tns),compressed air piping networks (1600m length), duct network (6,6 tns), ladders-stairs(10tns), rails-grating and various structures (7tns). Thermal insulation of the outer surfaces of sackfilter (~1300m2), colling tower (~700m2), fan shell, silos – piping – stack (~6500m2) including the material procurement and transportation to the site, scaffolding and lifting means. Material procurement, detail engineering, fabrication, painting and erection including all fastening material. Lazarides Bros - I.Dimou S.A.
Engineering, drafting, prefabrication of steel structure, platforms and ladders. Transportation and erection at site of the prefabrication steel structure. Equipment erection on the steel structures. Sandblasting - painting. Material procurement and prefabrication of all steel components of a new lime kiln of 150 tns capacity daily.